I have three new cookbooks! This, by far, is one of my favourites! Did you know that Vincent Price was a noted cook? He and his wife put out a handful of cookbooks over the years and Alex got me one of them! So much fun. We love his movies, and I love his cookbook! He also had his own line of wines and wine-tasting books. I also got the last two of the "Outdoor" Williams Sonoma collection. Two more wonderful cozy comfort cookbooks! (say that three times fast...) Out of the four in this collection, the Snow Country Cooking is definitely my favourite. Makes me want to hide out in a cabin on a snowy mountain and eat stew all night...I know, I'm likely jinxing myself considering we had snow until May this year! Aw, look at that sweet furry face! So happy to hear he's doing better. I had no idea Vincent Price was a noted cook! That is definitely a surprise to me. Cookbooks are so much fun, aren't they? I love flipping through them, especially if they have lots of those high gloss photos. Aw Jack! What a sweet face. How can you not just heap loads of hugs and sympathy on a face like that! And I didn't know Vincent Price was such a cook. Great addition to your cook book collection! Vincent Price was a very enjoyable actor. Had no idea he published cookbooks too! I had no idea he was known for his cooking and wines. I learn so much from you! I did love his movies. The William's Sonoma ones look really good especially the Snow Country as Fall and Winter are my favorite seasons. So glad Jack is feeling better...for you and for him! It's scary when they can't tell you what's wrong or how they are feeling although you probably guessed right. Have a great day! What recipe are you going to try first from which cookbook? Fun! one of my favorite cookbooks is his 'treasury of great recipes'. i think it's his best! i use it more than most cookbooks. he and his wife were quite the gastronomes! Well, darn. I may have to look into getting a couple of those luscious looking Williams-Sonoma books. Too, too intriguing! So glad to hear Jack is feeling better and you can avoid the vet office visit. Dogs are pretty tough little critters and given the time and lovin' usually pull themselves back around to normal. Sure would be interesting to know exactly what caused his problem though. Like Susan, I knew Vincent Price was a gourmet cook and art collector. Guess it stands to reason he'd be knowledgeable about wine, too. That I didn't know. Carol Burnett and her first husband, Joe Hamilton, were friends with Vincent and his wife and in one of her books she mentions going to their home frequently and what wonderful hosts they were. Yay for Jack being on the mend! Those eyes! YAYYYYY for Jack feeling better! Nothing worries me more, if my son or my dogs are sick. I hope by today he is 100%. 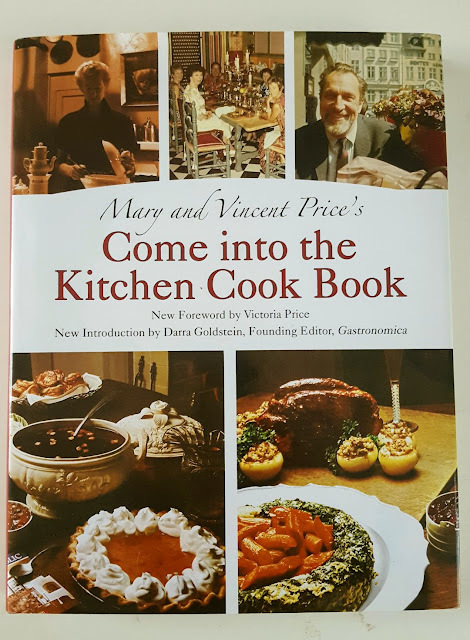 I LOVE Vincent Price and I did not know he has cookbooks! I need to see if my library has one I can lend. So glad your Jack is feeling better! It makes me smile how much fun you have in the kitchen. I love to cook too. Hi TB :)) I agree, he was great. Even when he did all those "B" horror movies, he was always so good in them. This book I have now is divided by "age"...meaning the chapters are "Recipes of Early America" to "Victorian America" all the way to "Modern America"...I love it! It's a history lesson as well. Hi Sam :)) I love Vincent Price's movies! Especially his film noirs. If you can find it, look for one called Dangerous Mission. It's a 1954 movie with Victor Mature and it takes place in a mountainous resort...villainy ensues lol...very good movie! 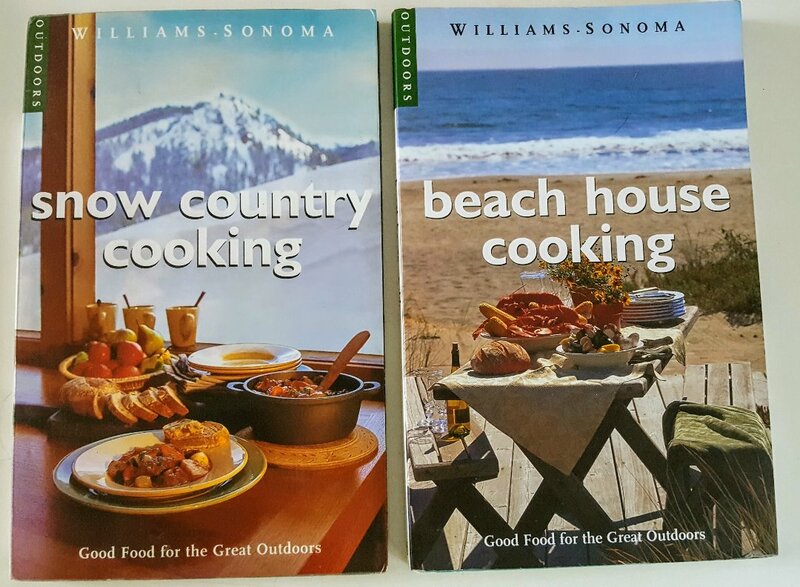 These two cookbooks from Williams Sonoma are part of the "Outdoor" 4-book series. Alex found them on Thriftbooks, I don't think they are in print anymore. One of the first recipes I'll probably make from the Snow Country book is their "Three Onion Soup with Gruyere Croutons" ooooooh! :) And they have a Coq Au Vin recipe that has brandy and red wine so that will be on the menu too! But I want to wait until the snow falls to try these out to keep with the theme! 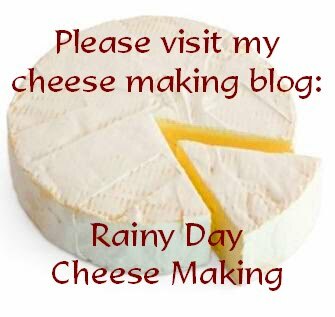 Hi Joyce :)) A Treasury of Great Recipes is another one on my wish list! :) He is all about "gracious living" and I love it! Hi Mama Pea :)) Alex has a way of finding just the right cookbook for me. That 4-book collection is just up my alley. Love them! I WISH I knew what the heck Jack ate to make him so sick. He has a digestion made of steel normally, he eats anything and everything but we keep such a close eye on him. We thought maybe a poisonous mushroom in the woods, or a toad...we have no idea. His nose is always to the ground, being a tracking dog, so by the time he has something in his mouth, his ears are hiding his face and we can't see what he did eat, only see him chewing. I'm watching him like a hawk now though! Oh, that's a book I will look for. I was a big Carol Burnett fan, I loved her show. Such a funny comedian and she did some film noirs too where she played dramatic roles. I'm really into biographies, I find them so interesting. Hi Nancy :)) Gluten-free sure is a challenge and I understand your lack of desire to cook...I remember it being tough when I had to do it for a year, it took all the pleasure out of cooking for me. But that was because I was so used to my bready-diet. Hi, Rain! 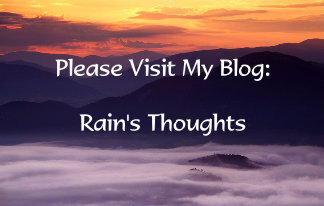 I read about your blog on Martha's Plowing through Life post. I enjoy cooking too. 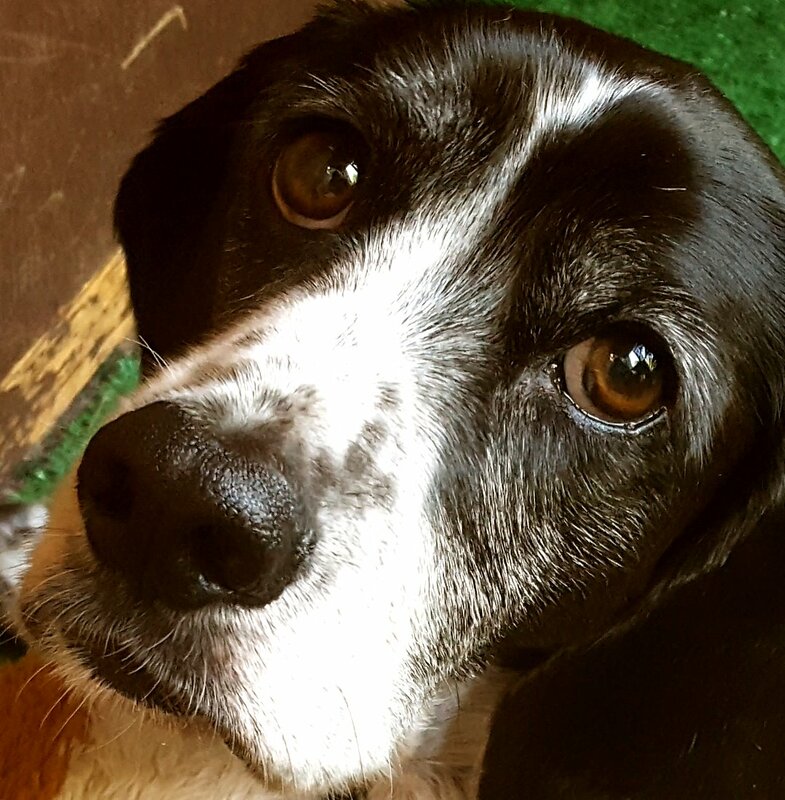 I'm sorry to hear that your fur baby Jack had been under the weather ~ hoe he's 100% before long! What a sweet photo, cute and lovely. And it must be nice to have so many cookbooks, warm greetings to you and thanks for dropping by! Hi Blogoratti :)) I love having all of these cookbooks...I actually take them all out monthly to try to plan dinners! Jack is heart, his eyes melt me lol! I'm glad that Jack is a bit bettereven if he is not back to full fitness yet. Those cook books look great to have. Hi Terry :) As I type this Jack is much better! I started him on his regular food tonight...just a bit though. I wish I could figure out what the heck he ate!